Earl's Super Stock hose ends are designed to be used with Earl's SUPER STOCK hose. They cannot be used with stainless steel braid protected or PTFE lined hose. On applications where the maximum temperature range is expected, a clamp or compressed Super Stock collar is required. Note: The aluminum crimp sleeve no longer comes with this hose end (it is available separately). Super Stock™ push-on hose ends are designed to be an attractive and lightweight direct replacement for the popular and economical brass push lock type. Machined from aluminum alloy and anodized in the familiar red and blue made famous by Earl's, they are available in all common AN 37° flare configurations and, as straight hose ends, with male NPT threads. 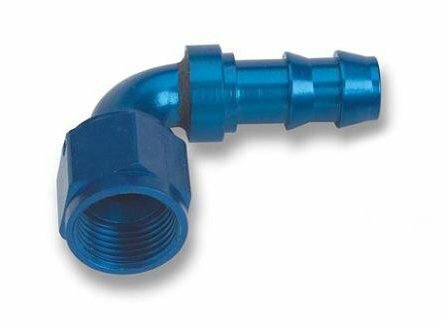 Designed to be used with our Super Stock™ hose, these hose ends are not intended for use with stainless braid-protected hoses or Pro-Lite 350™ or PTFE lined hose. A great budget hose end for race, marine, street & limited production OEM applications.